Berowra Waters is a hidden secret, located on Berowra Creek, a tributary of the Hawkesbury River. It is a suburb of northern Sydney, in the state of New South Wales, Australia. Berowra, an Aboriginal word that means place of many winds, is located 40 kilometres north of the Sydney CBD, in the Hornsby Shire and is part of the North Shore region. Berowra Waters is north-west of the suburbs of Berowra Heights and east of Berowra. There is a toll-free car ferry, The Berowra Waters Ferry, that connects the east bank to the west bank, with winding roads ascending uphill on both sides. There are only two crossings of Berowra Creek. The other, Galston Road, crosses the upper reaches via a bridge in the Galston Gorge, between Galston and Hornsby Heights. 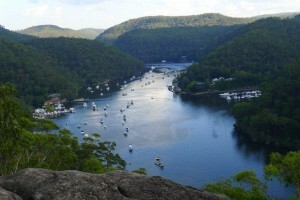 Berowra creek is about 30 kilometres long consisting of steeply incised gorges with surrounding plateau areas. It rises near Pennant Hills and flows generally north-north-east into the Hawkesbury River about 7 kilometres west of Brooklyn, and about 20 kilometres from the ocean. It is fed by a number of tributaries that drain the steep catchments adjacent to the waterway. The steep sides of the creek have limited development directly adjacent to the Berowra Creek estuary, most of which is only accessible by boat. 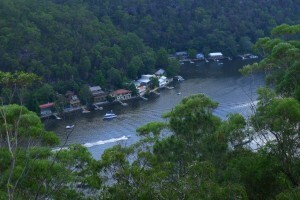 However the small settlements of Berowra Waters and Berowra Creek are both located on its banks. The creek is a popular destination for boating, fishing and other outdoor recreational activities.